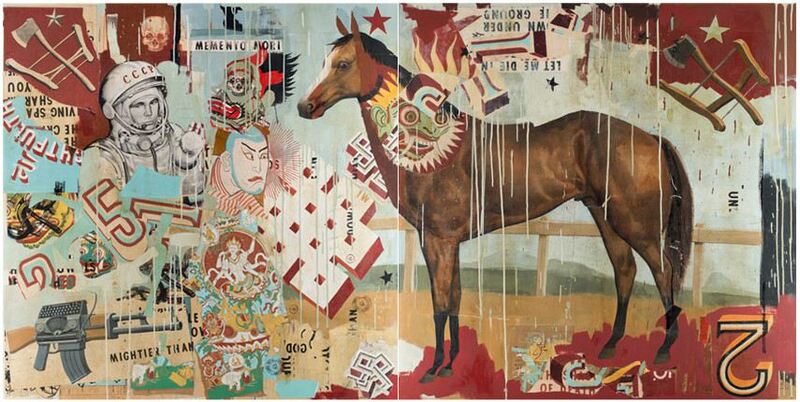 Ravi Zupa is an eclectic and self-taught American artist from Denver, Colorado that creates interesting pastiche prints, manufactured sculptures, music videos and big installations using a variety of styles and techniques. He finds his biggest inspiration in books, the bulk of different cultures, mythologies, and imagery from around the world and many different epochs. His art is colored with contemporaneity and political awareness and treats issues like violence, struggle, anarchism, dystopia, pop culture, power, ideology, political figures, etc. However, it has an old-looking aura about it like it was excavated long time ago. His studio practice combines several art techniques: print, painting, assemblage sculpture, collage, drawing, ceramic. From the first view you can notice numerous inspirations for Zupa’s ornate art that belong to older narratives and art movements; from German Renaissance, Eastern and religious iconography – from Hindu to Japanese samurai sources, medieval bestiary and botanic images, Mughal paintings, anthropomorphic beasts and animals, revolutionary and totalitarian propaganda and many more. Ravi Zupa usually mixes references, blends styles and epoch creating deeply provocative juxtapositions that communicate with current events. 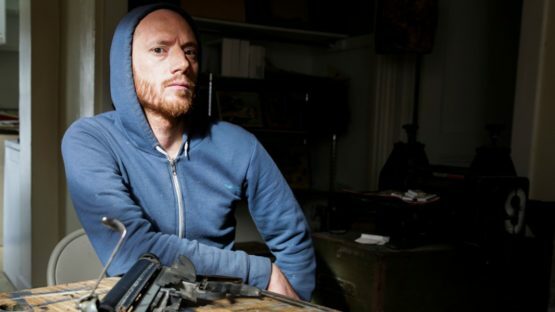 Political problems are his big concern and he believes that art is a powerful media to address them – it can be subtly subversive and enlightening regarding our everyday lives. Literature is one of the main referential points for Zupa, as he finds them as the best way to experience art. Same of his exhibitions are semi-quotations (Violence On Our Behalf was an exhibition in Matthew Namour Gallery, Montreal in year 2016, whose name is, for example, a part of George Orwell’s sentence People sleep peaceably in their beds at night only because rough men stand ready to do violence on their behalf.) and some reference statements such as the pen is mightier than the sword (show entitled Mightier than). In the last case, the exhibition consists of assemblage sculptures that are made of rifles and parts of typing machines and the monumental life size installation portrait of a Samurai on a horse with an assembled typewriter rifle. Regarding prints, he uses different media, from India ink, acrylic paint, latex, oil color, chalk, silk screen, collage, graphite, colored pencil, pastel, block print cut etc. As well, Ravi Zupa‘s work employs recycled media and materials such as old letters salvaged from dumpsters, blueprints, maps, envelopes. Zupa shows an astonishing ability of command over the variety of techniques and practices he involves – and the big thing about it all – everything he makes is hand-made! Besides that, he creates music videos for the label Anticon. He is active on social media such as Facebook and Instagram where you can see the new edition of his work and where he continues his activist approach and shares his love for art. In his home town Denver, the Black Book Gallery supports new editions of his art. 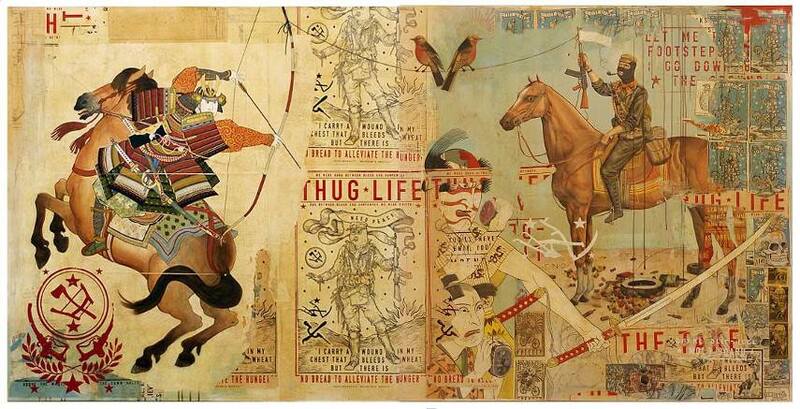 Ravi Zupa lives and works in Denver, Colorado.